Earlier this month I travelled to Sydney to attend a fitness summit which featured four key influencers of evidence based fitness: Alan Aragon, Brad Schoenfeld, Bret Contreras, and James Krieger. I had seen these guys speak last year in the UK and figured they would be presenting on similar topics, so the summit would simply offer networking opportunities more than anything. Being amongst Australia’s leading fitness professionals, it was in fact an investment in regards to connecting with like-minded people, but to my surprise and excitement, I actually learnt a few things too. First I want to start off by saying my career path has lead me to predominantly being office bound, as an online fitness coach offering minimal face to face training. This basically means I spend most of my time in front of a computer, and just two days per week working with clients in a gym. The weekend included a lot more walking than usual, and at the end of the first day, which included a trip to Bondi Beach and various tourists’ spots, I discovered that I had completed over 20,000 steps. To some people that isn’t so significant. In fact I had no idea that my phone and watch were actually tracking my steps. It was at that point where I discovered over 6 months of data that exposed my lack of general activity, some days recording as low as 400 steps. Moving forward I started to pay more attention to the steps taken over the next few days, and noticed a solid trend of 11,000-15,000 steps per day. Like I said, we did a lot of walking and I have to admit, I really enjoyed it. For a moment I wished I lived in the CBD of Sydney and everything I needed in life would be a walk away. With this feeling of pleasure towards a greater level of non-exercise activity, it came with great coincidence that James Krieger would present on the very topic. 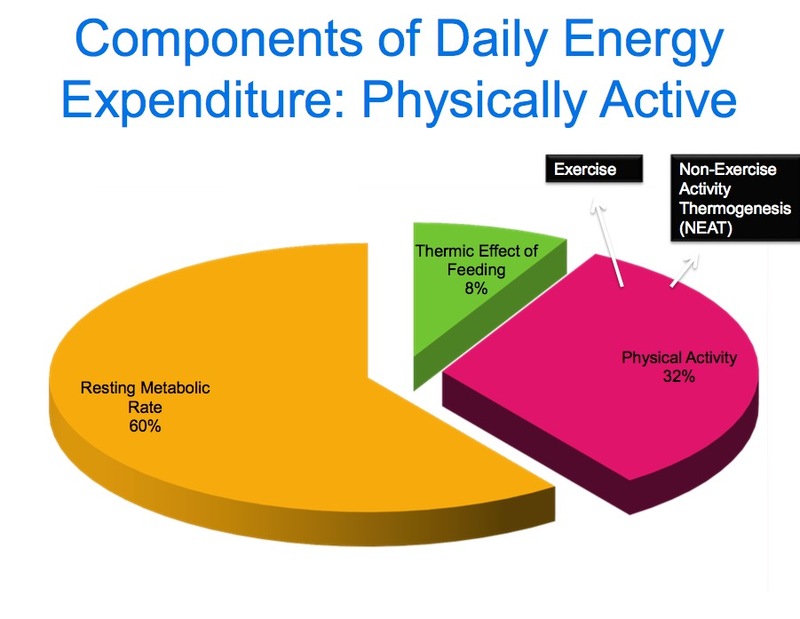 This essentially covers all movement that makes up our daily energy expenditure that isn’t planned or structured exercise. For example, walking to various places as I had been doing. NEAT also includes things like standing, performing daily tasks in the workplace, general fidgeting, washing your car, etc. Essentially all physical activity you aren’t stopping to think about or mapping a yearly periodized training plan for. Some of the points James made were really astounding and I immediately started thinking about the clients that I work with and how their various lifestyles come into play in relation to NEAT, and their current nutritional intake and structured training output. The general trend of office-bound clients being on lower calories and physically active clients dieting down on higher intakes would suggest a difference in NEAT being a contributing factor, however all too often we hear cases of “I have a slow metabolism”, rather than “I am not very active outside of structured exercise”. It was almost like a light-bulb went off, and I decided in order to test this hypothesis, I would issue the task to ALL of my clients to track their steps taken each day, and aim for 10,000 daily. I decided I would get involved to. I acknowledge that tracking your steps per day doesn’t make up for all of your NEAT, but it is a simple way of loosely monitoring a typical day and making changes which could support an individual’s goal. Now I do also work with plenty of clients looking to build muscle rather than fat loss, and the general consensus is more calories in, fewer calories out to get them closer to their goals. However, I wanted to track their steps to see if they were already exceeding 10,000 per day without even thinking about it. In my experience working with people who struggle to put on weight, they are typically highly active or have a low appetite. If we can reduce their activity and find strategies to increase their food intake they tend to grow. It has now been just over a week since issuing this homework and I have to say the feedback has been exactly as I expected. Clients who are typically on the lower end of non-exercise activity made a conscious effort to be more active and reach their goal for the day. They went out of their way to walk to complete tasks, and some even had to go for evening walks with their partner to reach their target. Others completed the task with great ease, some exceeding over 20,000 steps and not even thinking about it. I definitely think we’re onto something here! So for myself, deciding to get involved too – which could in fact be of benefit towards my current bodybuilding contest prep phase, I’ve been walking to work, walking to the coffee shop, walking my dog, and even walking to my weekly remedial massage. As a result, on average I’ve completed 11,131 steps per day for the past 7 days. In the process I’ve listened to 3 audiobooks, multiple podcasts, and watched the fourth quarter of the NBA finals whilst walking, but none of that really matters. The changes I’ve seen in my physique have been obvious. Given that my diet and structured training is set up to have me in a caloric deficit already, I can’t say that the results are solely from increased NEAT, however there is no doubt that it has played a role which has prompted me to write this blog. Some anecdotal evidence to share is the following. Looking back at the data recorded by my smartphone; on average for the past six months I have been completing 4,400 steps per day. Days spent at the gym with clients would climb up to 7,000 and office days often around the 2,000 mark. By increasing my steps to a minimum of 10,000 per day for the past two weeks and maintaining a controlled nutritional intake and structured weight-training program, I have essentially almost tripled my trackable NEAT (steps taken per day on average) with a noticeable decrease in strength in the past few days, particularly on Thursday. Looking at my recent data, I had walked 17,000 steps on Monday and then over 11,000 on Wednesday, which was also a non-training and lower carb day, which could contribute to lesser energy for the following day. By pulling back my steps closer to 8,000 on Thursday I was able to complete my training session on Friday with greater energy and focus. Again all anecdotal, but by monitoring my steps taken I’ve been able to reduce the variables which influence the rate of fat loss, as well as greater control of energy geared towards planned training sessions. Something else to note which James mentioned, is that in some cases we go to the gym and put in so much effort, that we end up on the couch for the rest of the day, also resulting in fewer calories expended compared to someone who puts in slightly less effort in the gym, but maintains higher activity throughout the day. Armed with this knowledge I feel we could be more mindful of our daily activity levels in relation to NEAT, and stand up more often, reduce the couch surfing, and see an improved rate of fat loss as a result. On the other hand, we can increase our awareness of NEAT and reduce it where possible to improve structured training performance, or increase our caloric intake to suit. For myself, I plan to continue to monitor my steps taken each day, however I am going to pull back my daily target of 10,000 steps down to 8,000 steps with a greater focus on training performance and strength progression, whilst still exceeding my typical average of 4,400 steps per day. I’ve explained to some of my clients that 10,000 steps is simply a generic target to increase awareness and should be adjusted to suit each of us. Aiming to hit 10,000 steps per day if you’re accustomed to 1,000 is not going to be an easy task, whilst simply shifting to 3,000 steps per day is a 300% improvement. Setup your iPhone to track your steps and see where you’re sitting, and where you should stand.